On a second look, there is a low level altcoin loss reversal in the making. 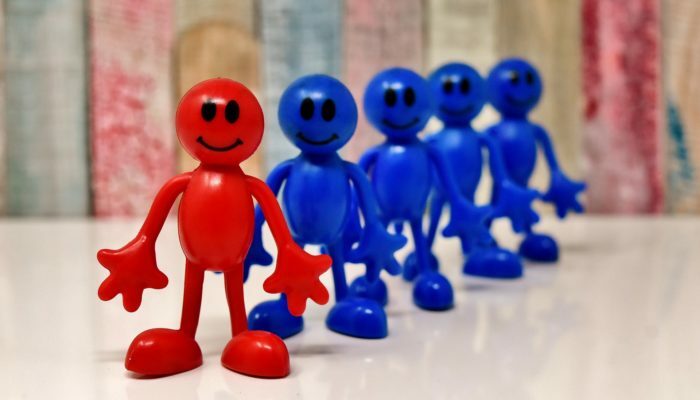 Prices are in the red but with a five percent gain in Bitcoin over the same period, we might see higher highs in EOS, Litecoin, Monero, Stellar and Cardano (ADA) today if not for the rest of the week. The reason is simple: Bitcoin leads the altcoin market. Since most are pegged to it, any gain or loss in Bitcoin would draw altcoins in that direction regardless of coin specific fundamentals in question. Komodo set the stage rolling for atomic swaps-where users can exchange their cryptocurrencies for another without third parties. Sources are EOS–BTC atomic swap is on the cards and might be coming through this week courtesy of Online. Though it’s positive that EOS prices are still trading within Aug 27 short term trend defining candlestick, our EOS trade plan remains solid and damping for scalpers. Prices are trading within a tight trade range and as per our early iterations, candlesticks arrangement demands trading only when prices are above $5.5 or below $4.5-our lower limit. Before then, we suggest taking a neutral stand aware that the longer the markets accumulate, the stronger the break out would be. There is discontent brewing in the crypto verse mainly because of Litecoin’s GitHub inactivity. As one of the largest cryptocurrency with a vibrant community, many expect high octane on chain updates but contrary to expectations, it has been a no show for four straight months. The last update came after their partnership with CoinBase on Shift Visa Debit Card according to data from GitHub charts. Our last Litecoin recommendation was to go long following end of last week’s higher highs. While we shall hold on to that projection, fact that the market might slide back and snap back to bearish as it has been the case in the last eight months is destabilizing. Notice that yesterday’s two percent loss might ignite further lower lows but before conservative sell and buy trigger at $50 and $65-$70 zone are hit, our longs would remain as it is. Technically, short term bulls would be live once there is a breach above Aug 17 highs at $62 and that’s the recovery we are anchoring our revival on. Withdrawals in USD, Euro will now be possible on the Stellar Network via Fintech LTD’s WSD coin. Fintech LTD is a DEX on the Stellar Network. Aside from the 19 day consolidation trending inside Aug 8 bear candlestick high low and moving along 22 cents, Stellar Lumens prices are finding support along the monthly support trend line as our chart shows. 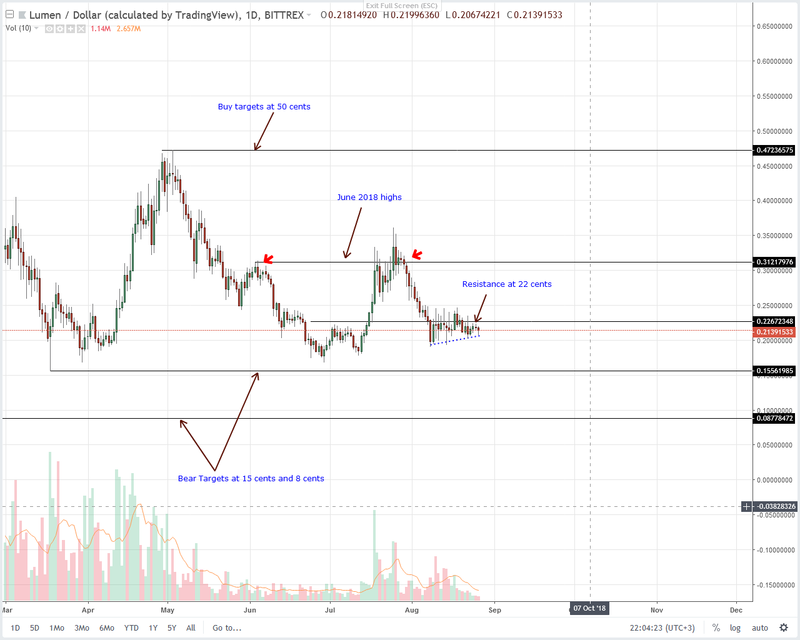 Sticking to our previous Stellar Lumens price analysis, XLM risk averse traders are advised to go long once XLM bulls edge past 26 cents on the upside. On the flip side, sellers can tow with the general slide if there is a dip below 18 cents—which doubles up as 2018 lows. 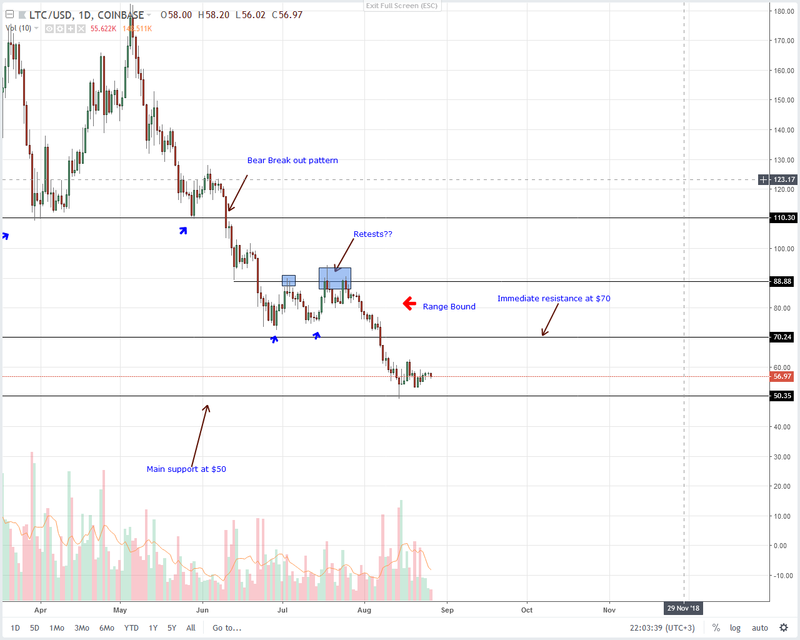 It’s a stalemate as far as Monero price action is concerned. Despite the jump in market cap pushing the coin back into the top 10, traders didn’t register major gains in the last week and technically, Monero is a sell. Initial support stands at $70 and for short term buyers to make a comeback then we must see prices reversing above Aug 18 Evening Star highs at $110. Thereafter, we suggest buying on pull backs with stops at $100 and first targets at $150. 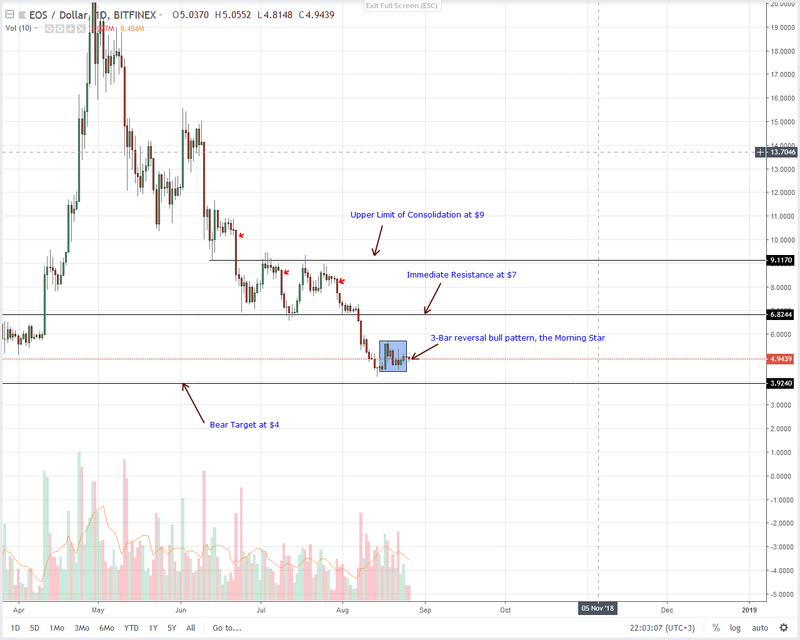 On a weekly basis, Cardano (ADA) is down seven percent and trading within a break out trade pattern ignited by Aug 8 high volume bear candlestick. 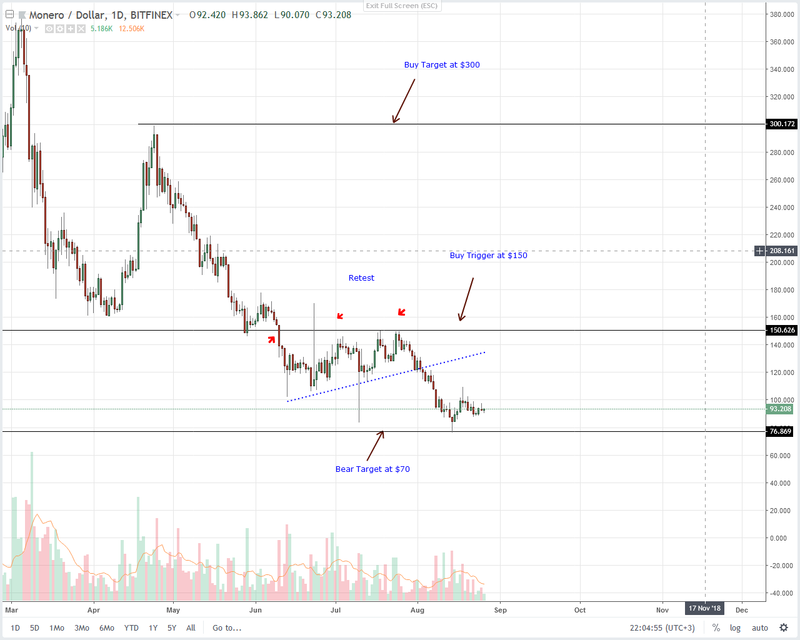 That sell candlestick which broke below 12 cents, our main support trend line ushered a wave of sell pressure and at current prices, odds are ADA may found next support at 7 cents which is ADA’s all time lows. Should there be a recovery then it’s likely that buyers might push prices back to 12 cents before dropping back to 7 cents or lower. 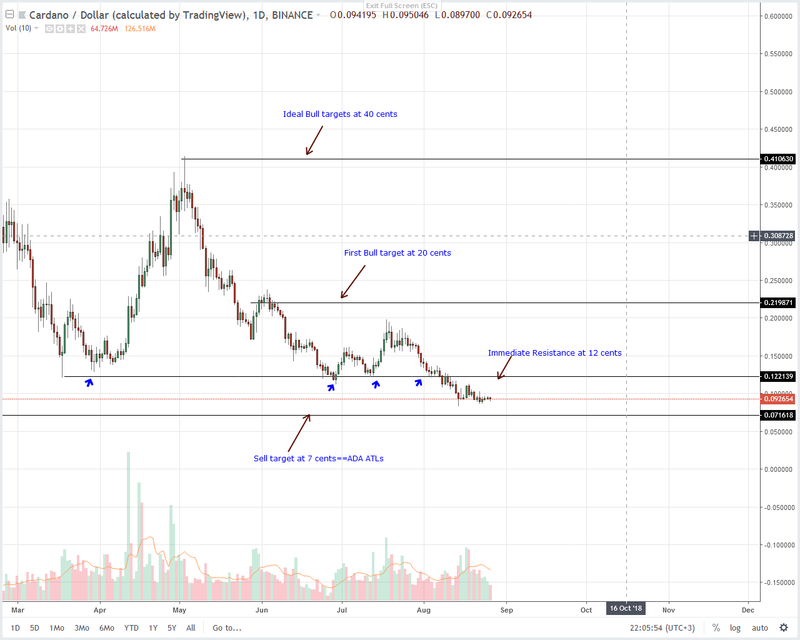 Though our Cardano (ADA) trade plan is active and we still hold on to sells, any jut above 10 cents invalidates this trade plan.